This year have a healthy Halloween, skip the candy and invite your friends to attend a yoga theme Halloween costume party instead. Have your friends try out a costume that will leave them feeling fitter and more flexible than they have in years. There are hundreds of yoga Halloween costumes to choose from and a crow, lion, cat, cobra, warrior, eagle, and tree are only a few of the great disguises that there are to choose from. Your guests may find that once they have given these yoga costumes a try that they just might want to stay in disguise all year. So treat yourself and your friends to a healthy lifestyle this Halloween and try out a yoga theme Halloween costume party. ->Serve up healthy blood colored cocktails in fancy wine glasses or clear glass test tubes. 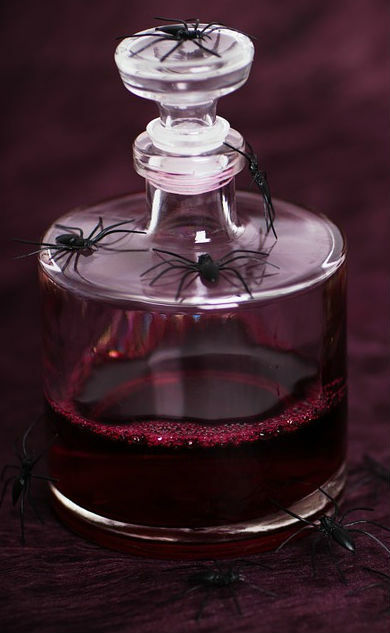 Blood red or gooey green beverages add a delightful decor to the Halloween buffet table. Pull out the tomato juice, V8 vegetable cocktail, black cherry, pomegranate juice (my personal favorite), or red wine, and create a vampishly delicious test tube shot glass display for your Yoga party. -> You can get really funny with your party beverages and do up jello shots for your guests. Literally speaking syringe needle shots are a real hit at Halloween parties. Fill up test tubes or syringe tubes with jello shots, tomato juice, or red wine for a wickedly wonderful party shot. 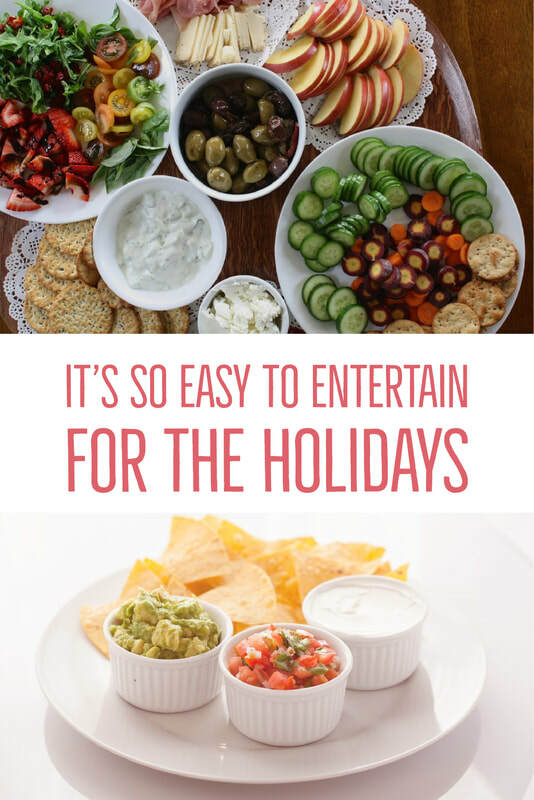 -> Serve healthy snack trays. Vegetables, nuts, fresh fruit, and cheese can be prepared onto decorative Halloween theme serving trays. -> Mold it into something gruesome. Gel up a Jello brain salad for your party. Sugar free jello can make the most amazing salads. You can make a vegetable or a fruit gel salad for your party, both are nutritious, and equally delicious. Use a decorative Halloween mold to create a delightfully eerie brain salad. It truly is amazing to see what some folks have on their mind these days. For a fruit salad combine one can of fruit cocktail with 2 boxes of Jello. For a vegetable salad add in grated carrots and celery rather than the fruit. It really is kind of spooky how the yoga poses can easily and eerily twist the body into an entirely different form. Before you even realize what is happening you've turned into a totally new you. This year treat yourself to some healthy Halloween fun by skipping the candy and hosting a healthy yoga Halloween party instead. Have your guests dress in appropriate yoga theme Halloween costumes, spend a portion of the evening on yoga exercise and meditation, or have guests perform the yoga pose that their costume represents. ​ Guess the pose, Guess the suggested length of time pose should be held, Yoga dance, Yoga conga line, Yoga theme Simon says, Skeleton scavenger hunt, Pin the tail on the yoga instructor, and other yoga themed games. Be creative in your design and choice of yoga activities. Many common games and dances can be converted into a yoga theme. ->Prizes for events and costume judging could be of a healthier theme. i.e. : yoga books, yoga gear, fitness gear, or other health related materials. How to do a Yoga Crow Pose. Health Benefits of Performing A Halloween Yoga Crow Posture. Strengthens your wrists and arms. Relieves tension in your back. The black crow fits in ideally with the atmosphere of Halloween. How to perform a yoga lion pose. Health Benefits of Performing a Yoga Lion Posture. This yoga posture focuses on the face, jaw, mouth, throat, and tongue. This pose helps to relieve tension and stiffness from the jaw. It is also considered to be an anti-aging pose as it helps to prevent wrinkles. How to perform the yoga eagle pose. Health Benefits of Performing a Yoga Eagle Posture. The Eagle yoga posture places emphasis on the shoulders, hips, thighs, calves, and ankles. It is an advanced pose that requires some acquired flexibility, good balance, and concentration. How to do a Yoga Cobra pose. Health Benefits of Performing a Yoga Cobra Posture. The yoga cobra posture is quite a simple posture to perform so even a beginner will be able to master this position quickly. This pose will help to strengthen your wrists, arms, and back. The cobra pose releases tension from the back and spine and initiates a feeling of deep relaxation. 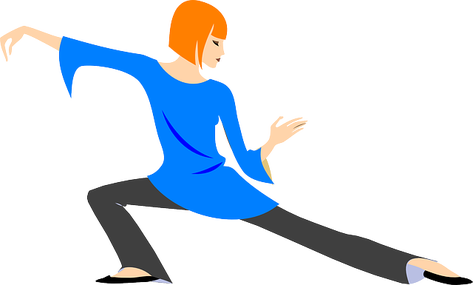 How to do the dancing warrior pose. Health Benefits of Performing A Halloween Yoga Warrior Posture. Increase strength and functionality of the chest, lungs, shoulders, and neck. Strengthen the lower body and back. Health Benefits of Performing A Halloween Yoga Cat Posture. Stretches the neck, back, and torso. Encourages blood flow throughout the spinal area. Relaxes tension within the back and neck area. Try on a yoga Halloween costume this year and see how it makes you look and feel. You don't really need cosmetics, a mask, or a wig. A simple relaxed attitude and a few minutes of your time is all that it takes. The yoga postures easily and eerily twist your body into a completely new being. It is so relaxingly rejuvenating. If you decide to host a theme party you may find that once your guests have given the yoga games a try that they just may want to incorporate the poses into their lifestyle all year long. 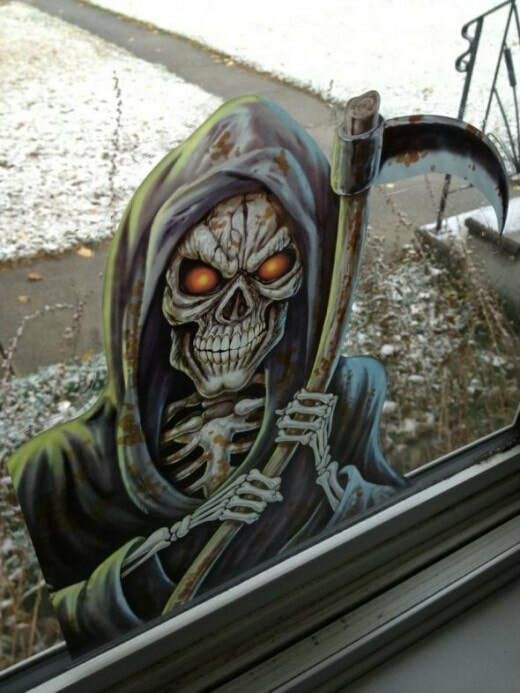 And don't forget to keep your pets indoors on Halloween night. 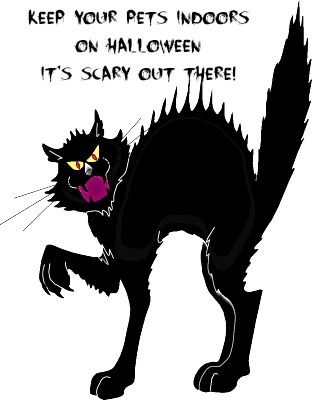 It can be a very scary place out there on All Hallows Eve and not all the monsters out there are critter friendly.